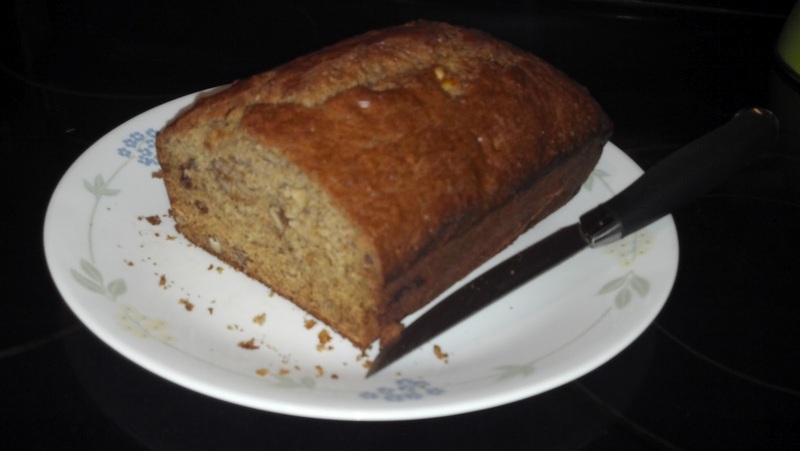 This morning I decided to make a treat for breakfast and stir up some Banana Nut Bread. I had a couple of over-ripe bananas and leftover walnuts, so whipping up some bread was a must. Although I have had some trouble getting my mixture exact in the past, this morning proved to be a success! 1. In a mixing bowl, cream margarine and sugar. 2. In a separate bowl, combine dry ingredients. 3. Add the bananas and eggs to the mixing bowl and mix thoroughly. 4. Add the wet ingredients to the dry mixture and stir until just combined. 5. Fold in the walnuts. 6. Place in a greased loaf pan and bake for 1 hour.